The eight and half acres of land across the lanjozam(cantilever bridge) near tashochhodzong is been identified to build a memorable park. one portion of the land belongs to the government, and the other to the Royal Grand mother Ashi kezang Choden Wangchuk.the royal grand mother has named the upcoming park Gongzin Sonam Tobgye Dorji and Lyenchoen Jigme palden Dorji Memorable Garden. 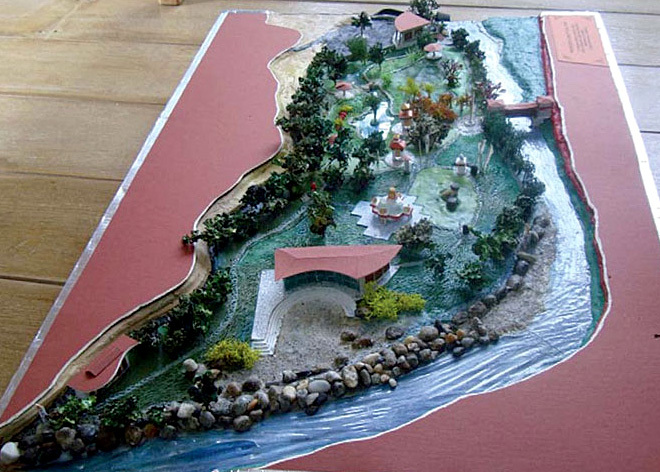 The official from the Nature recreation and ecotourism division(NRED) said the park is being constructed to protect the sanctity of the dzong and nature serving the purpose of a recreational spot for Thimphu citizens.Their will be structures like gazebos, sand beach, toilets,a parking lots.pond with a seepage control, and aquatic lives.and also concrete cantilever bridge over the pond with underground pipelines to supply water. The main concept of the design was made by Vast founder and artist karma wangdi(Azha karma),based on the requirements of the project made by the Royal Grandmother.He said “The idea is to avoid any kind of foreign elements and keep the area as natural as possible”.